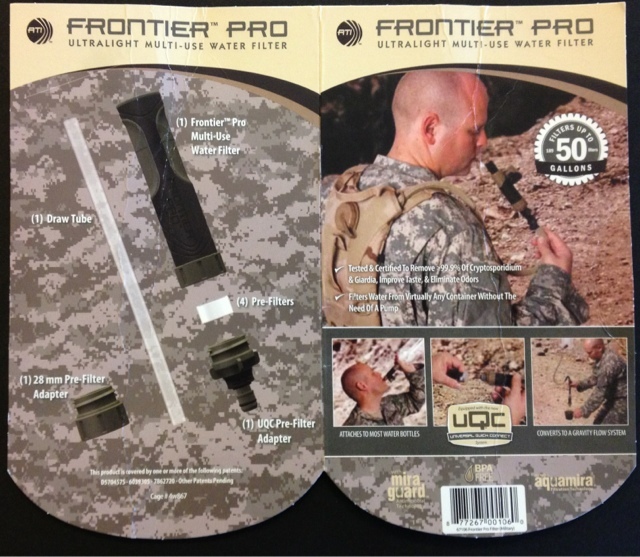 McNett's Frontier Pro Water Filter is the Swiss Army Knife of personal water filtration. While not yet perfect, The Frontier Pro offers highly useful capabilities as it currently exists, and -- with a few modifications -- would merit mandatory inclusion in every Tactical Trekker's backpack, in warfighter and first-responder disaster gear, and in home "Prepper" kits. What's more, the Frontier Pro weighs in at 64 grams including bite valve, all the standard adapters and the pre-filter. That's just 2.3 ounces, way under the 13-3/8 ounce MSR Sweetwater that I've been hauling around (see Aquamira: This Could Change Everything for more details on that). Cutting needless ounces adds up to pounds more capacity for payload or more distance for the trekker. Ounce-by-ounce I have reduced my three-season backpack from 55+ pounds to just over 40 so far. My goal is 35 pounds, and the 11 ounces the Frontier Pro could provide would make a difference. If bugs can be worked out. The Frontier Pro is easy to use. 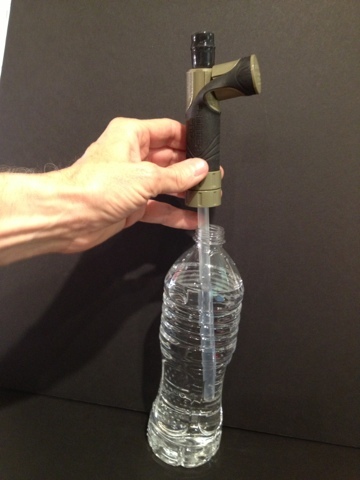 In one configuration, it uses the standard plastic tube as a straw. Once the filter in a brand-new unit is cleared of the carbon filter schmutz (see previous Aquamira review), the water is has no off-tastes and flows through with less more effort than drinking a Slushee through a straw. Water flows readily enough to use the unit in a gravity-flow situation without having to pressurize the supply such as by squeezing a hydration bladder. The attachment point for the straw also has a set of threads that are supposed to attach to standard water bottles, but we were unsuccessful in getting that to work. We tried two sizes, including the half-liter bottle illustrated above. Removing the adapter the straw attaches to, allows an easy connection to a standard garden hose bib or water heater drain. In a disaster, the water in your hot water heater may be the only water you have. Depending upon circumstances, the water may be sanitary but taste bad or --in older units -- turbid with sediment. In addition, the water could be contaminated by water from a damaged treatment plant. 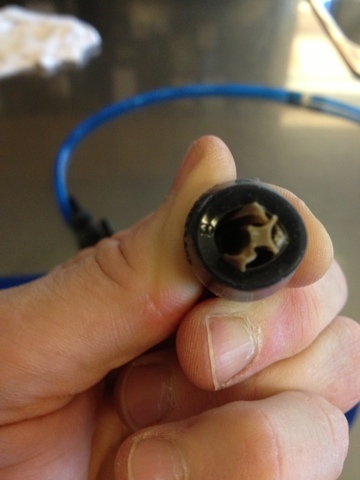 In the image, above, we removed the bite valve and used a length of Camelbak tubing as a gravity flow outlet. The replaceable pre-filter (below) did a thorough job of keeping sediment from reaching (and clogging) the actual filter. The Frontier Pro can be purchased from various Internet retailers at prices ranging from $19.99 to $24.95. But caution, it is not re-loadable. Read on for details. The Frontier Pro illustrated in this review was an evaluation unit McNett sent following a booth conversation at the 2013 Shot Show in Las Vegas. I evaluated the unit several weeks ago and received a reply which indicates that McNett knows the Frontier Pro is a work in progress. First of all, I found their bite valve clunky and much harder to use than the CamelBak. As illustrated above, the bite valve is removable. But the attachment point that remains fits the straw provided, but is too big to allow a standard bite valve to be attached. 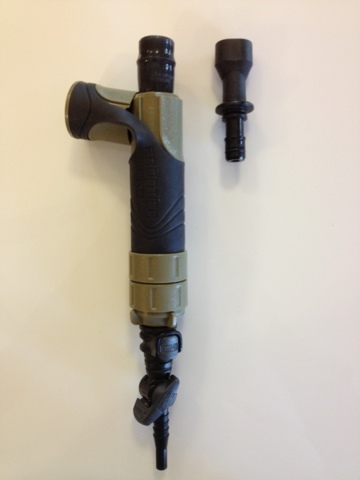 The plastic interior parts of the bite valve are easily damaged and do not replace very easily (below). 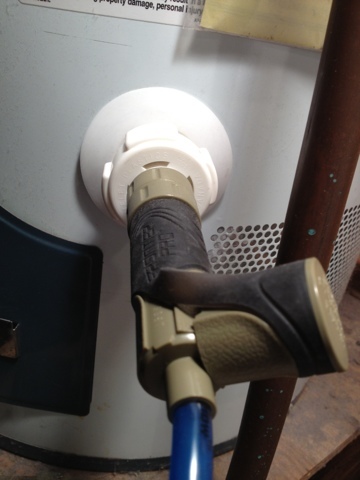 As illustrated in the water heater image, above, the inside diameter of the straw attachment is large enough to slide hydration tubing inside .) But it takes only about 10 ounces of force to pull the tube out. Any rough treatment and the connection will break. Bad news for combat and tactical trekking. This is a big contrast with a standard bite valve which requires a sustained pull and twist operation to remove. A small improvement would offer a connection to s standard bite valve. A huge improvement would be a secure adapter compatible with the female Hydrolink connector. As illustrated, above (and below) the Frontier Pro's quick release input, connects easily to a Hydrolink and to the CamelBak. Attaching the Pioneer Pro to the drinking end of the tube puts a lot of awkward weight and bulk out in the chest area. Finding a suitable attachment point for something that is trying to swing or snag on objects adds needless hassles to hydration. In addition, extra long tubing is needed in order to get the bite valve to the drinker's mouth. Some of this is illustrated in this first fumbling video by Tactical Trekker's editor, Lewis Perdue. Any barrier to hydration, any extra time needed and the potential need for using two hands increases the risk that that a trekker or warfighter will fail to drink enough water. This give a bit better close-up of the solution proposed in the video. 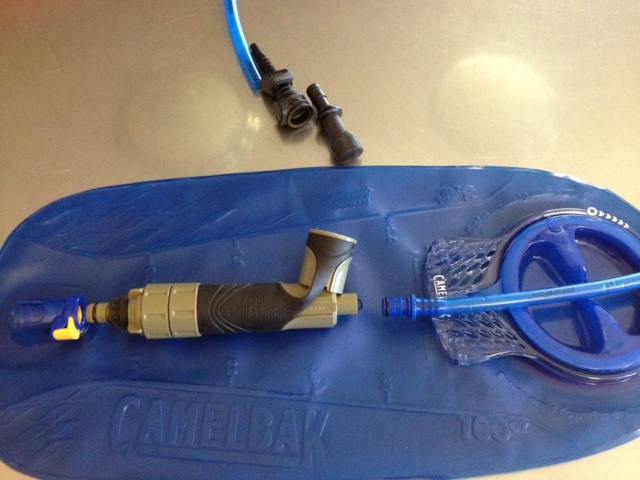 Because the Pioneer Pro already has a quick release fitting that mates with the base of the CamelBak and other hydration bladders, one efficient solution would be to provide a secure female adapter at the current bite valve/straw attachment point that would mate with the standard male quick release made by CamelBak either for their Hydrolink or the bladder points. The Frontier Pro, according to McNett, will filter 50 gallons of water. Then it's done for. The filter is not replaceable. Seems like a waste to just toss the case and the adapters into the trash. Not to mention a waste. My final suggestion would be to replace the clean-water end (on the right, above) with a screw-on cap to allow filter replacement. 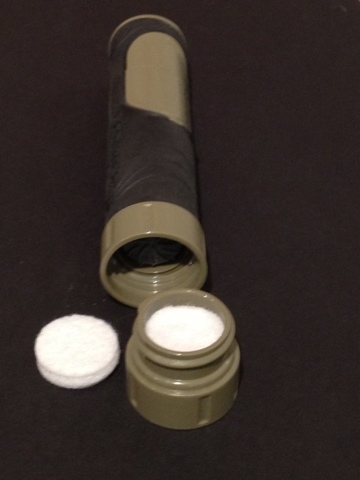 At the same time, that end could be configured to accept a variety of interfaces -- Hydrolink included -- that could solve the issues raised above and allow it to connect to the base of a hydration bladder where it belongs for most efficient use. NOTE: I consistently -- and mistakenly -- called the Hydrolink a "Hydrolock" in the video. Senior moment. I apologize. I visited a flood affected area as a voluntary rescuer, and I was advised to distribute survival kits along with water filtration straws. They did not forget to provide them for me as well, because they wanted to prevent spread of water born diseases in the region.